Studham Common Walk at Studham Walking RouteStudham Common, in South Bedfordshire, has been used as common land for centuries. Today this beautiful open space is a highly prized feature of the village, valued by the community as a place of recreation and a haven for wildlife. 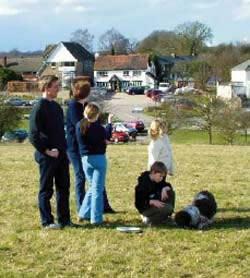 The common is in the Chilterns Area of Outstanding Natural Beauty and is a designated County Wildlife Site. Start/Finish Point: The walk starts and ends at the War Memorial on West Common, close to the Red Lion PH. Start Nat GR: TL022157. Studham Common, in South Bedfordshire, has been used as common land for centuries. Today this beautiful open space is a highly prized feature of the village, valued by the community as a place of recreation and a haven for wildlife. The common is in the Chilterns Area of Outstanding Natural Beauty and is a designated County Wildlife Site. How to get there by car/Parking: Studham lies 10km (6miles) west of the M1 (Junction 9 or 10) and the A5. It is 6km (4miles) due south of Dunstable on the B4541 and 12km (7miles) north of Hemel Hempstead, just off the A4146. There are small car parks on East and Middle Commons.